This post serves as my entry to the Pod and Planet Fiction Contest YC117 this year. The main character featured in this news report style article is taken from a real EVE capsuleer who’s proficient in the art of internet spaceship insurance fraud. The content to be considered for judging starts from the next section onwards. Our current main offices reside inside the bustling trade hub station of Amarr. Wrecks can be seen littered all over the undock. Nothing new all in all for this station. Further out though lies a capital ship freighter wreck currently being salvaged by several enterprising frigates. CONCORD are examining the remains of this wreck as we write this, as it has obvious signs of modern day ship insurance fraud. This is however by no means the first time we’ve chosen to report on the steadily growing influx of ship insurance fraud, and if trends continue it will probably not be the last. The sight we’ve seen ourselves in previous articles that new players emerge daily in this game of fraud. Most of them firmly with their eye on the potential ISK up for grabs. The man known only as Market Tycoon is one of the more recent players of this “dangerous game”. One who has captured the imaginations and hearts of many inside of the public “NPSI” circles. He in the realms of the latter seems to have created something of a minor celebrity for himself. We managed to get an interview with this mysterious figure to try and catch a glimpse of the underground fraud scene as a whole, and perhaps unravel some of the mystery surrounding his own mysterious character. For his own security he asked us not to reveal certain details divulged in the interview and that we refrain from quoting him verbatim on several sensitive areas. With which he continued to say; pulling the wool over CONCORD’s eyes and seeing the insurance ISK roll into his wallet provided a feeling like no other. Something he believed was part of the motivation behind the continuation of the ship insurance fraud crime wave. His new calling he explained was one that is infinitely more fulfilling than the last, and he knew others who felt the same. Taking this a bit further we asked how many others he knew were involved in crimes of this sort. Market was reluctant to answer at first, but did say there are a group of several others he is familiar with who meet often to discuss the “trade”. Furthermore there have been some he said who came to him for “advice”. Seeking to emulate the actions of those like himself. He was of course not giving out any names. Most of the image though he admitted to being confined to the public fleet communities familiar with his exploits, and not much further than that. The interview we had with our source culminated in him affirming his desire to continue playing the system, and emphasised that in reality he was doing nothing wrong. He referred to his actions as being “technically inside the law.” CONCORD naturally of course disagree with this sentiment. As they have stated on many occasions when being forced to respond to unending criticism for their lack of foresight in regulating and maintaining the capsuleer insurance laws. Some of which have only been changed in recent times to cater for issues outside of the scope of this article. This interview we conducted with Market leaves us with conflicted views on the subject. On one hand this is clearly some sort of manipulation of the system. Whilst on the other CONCORD seems seriously lacking their responsibility and sheer ability to handle the situation at large. Regardless we expect this ever growing phenomena to continue to affect New Eden’s space lanes for a long time to come. Has you or someone you know been personally affected by insurance fraud? If so please don’t get in touch. Instead send all fraud enquiries directly to CONCORD. Thanks! “From Riches to Riches” came third in this years contest within its category! See the “Winning Stories” page for a list of the victors and categories. 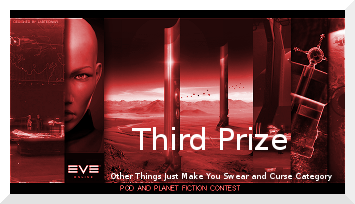 Prizes are described on the “Prizes” page. More details as well as comments can be found here and here. Thanks goes out to Sam who always puts a lot of work into bringing these contests to fruition, and for the judges who sacrificed some of their spare time to read through the many contest entries. A long time ago in a galaxy far far away… There was the Jukebox. Hailed by carebears as an integral cog in the EVE online experience, shunned by leet space bushido pvper’s as an unnecessary factor in the way of the pew, and ridiculed by satirists everywhere as an object of non-existence (hence my familiar title). This portion of the ye olde EVE UI I speak of allowed pilots to control the thematic and at times beautiful music created by CCP RealX upon EVE’s early development. Tracks of which players came to know and get all nostalgic over when blared out at max volume, whilst cruising around. You could as expected (or remembered) listen to the tracks in order, randomise them if you preferred, create your own playlist, or just play your favourite piece over and over again until you find yourself humming it out loud at 3:00 AM in the morning, much to the annoyance of others. However In 2013 this feature was (to a mixed reception) removed from the game by CCP to make way for a new adaptive soundscape in its place. So why is it that today two years later “sound“ in EVE has continued largely to be considered by numerable players as a non-entity. Its credence limited perhaps to effects rather than the once more highly appreciated music. We can still hear the classic “EVE has sound?” joke whenever the matter of audio is brought up, but is this just a recurring comedic cliche vets hold onto. Or is the sound of EVE still not up to scratch, a shadow of its former self, and above all else, does anyone even care? Let’s start by being clear and honest about this, it’s not really one of the most pressing issues in EVE. Or a particularly crucial one to EVE as a whole. There’s a very lengthy albeit debatable list of things that we’d likely all agree should come much higher up on the ladder, that need attending to before this jukebox business comes into play. Sovereignty and structures of course come to mind and are fresh in our heads at present. The sound of EVE as an all encompassing element though I’d say ranks somewhere higher than we might first realise. In other games or media it’s considered a core aspect of the product, and adds a great deal to the experience in question. Often winning awards or accolades for its addition to the game’s worldliness. So do people despite this tradition care in the case of EVE? And how has the new soundscape system actually performed two years on. Well… It seems there are some who do care and have things to say about it. This thirty-seven page thread in the above link on the official forums contains players who want the old jukebox system re-instating, or some new iteration of it in its place. With feedback and contemptuous remarks about the new system I dubbed soundscape earlier on offer. The latest post in this thread was quite recent in relation to the time of writing this post (2015-03-18). Which surprised me as it means either some players haven’t moved on or just simply think it still needs returning over the current system. So it’s not exactly something these players have forgotten or let go, even if their counterparts will confine their views to opinions of the misinformed, and aren’t really bothered. Anyone else missing the jukebox? There’s more! 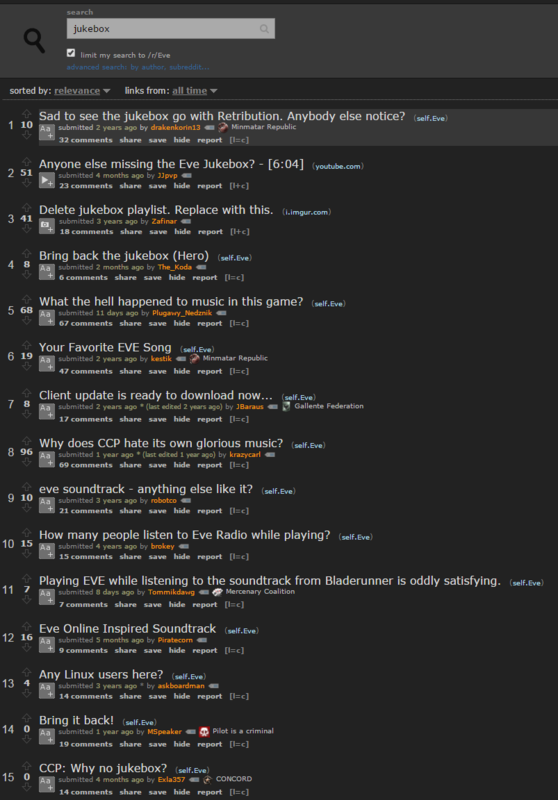 The wonderful denizens of /r/eve on Reddit display their own thoughts on the jukebox’s absence and our new soundscape we find ourselves enveloped in (or not as the case may be). Click the previous link to see one of a significant number of these “Bring Back Jukebox or Riot“ threads and their contents. It would seem at least to me that there is a missed opportunity here for renovation or some form of reconciliation, and that there are those in the player base who still care quite strongly about the thing, and the state of EVE’s sound in general. But can the newer updated replaced soundscape be as lackluster as these sources claim? The second question I asked was how has the new sound implementation faired since its introduction. Personally I think it’s had a very shallow impact thus far. Perhaps excluding effects that aren’t inclusive to the jukebox like pew pew lasers, guns, explosions, which appear to be vastly improved/improving, and have come along way. I’ll try and explain why I think this in the rest of this section by examining the devblog that heralded the change. Most of the new muscape’s intentions and merits as a replacement system are included in the last link above from a concise devblog written by CCP t0rfifrans two years ago. So let’s examine the current state of the “muscape” two years on. As part of removing the jukebox these songs are now available on CCP’s Soundcloud page, and this is the provided workaround for those missing the Jukebox’s functionality. I like this in fairness as an idea because they could have just said “it’s gone, deal with it” and they didn’t. On the other hand though I can’t help but think this is reminiscent of passing the book, and deferring the duty of providing a quality sound experience for the game. it’s certainly very external and not that integral i.e. outside of the client. Making it not feel part of the equation if the player’s adopt this method rather than the new muscape feature. I’m also sadly finding it hard to treasure the obscure pitch alteration on the in-game tracks that are applied depending upon certain system factors, mainly because if I’m being honest… I usually don’t even notice the difference. If this was a good idea wouldn’t it have a noticeable effect on the player? I’m told speed is varied too as part of this which you can hear in the next two clips. He points out that it would take much needed development time from other areas of the game, to continue supporting the jukebox, and that the code base would benefit in terms of maintainability with its removal. Which sounds fair really. I wonder now in mid 2015 with the new release cycle in place if there’s room for this to slowly grow again as a feature to consider. After things like sovereignty and structures are advanced as we mentioned earlier. We all know how vast EVE is and it’s packed full of stars. In my relatively short time in EVE I’ve managed to venture past a probably unhealthy number of these stars and their systems (see below image). This is by no means anywhere even close to all of them or the majority in existence, but is a biased mix of highsec, lowsec, nullsec, and the not shown wormhole space. So evidently this is where I’ve been in-game at some point, often repeatedly. But for the life of me I couldn’t tell you what tracks play where or how much of an epic experience the muscape made my playing there. To summarise another issue in one sentence. I get the same song(s) over and over again. A large portion of the tracks I swear I haven’t even heard once since the new system was implemented. So my thoughts with this are simply why is the sound NOT having a beneficial effect on the experience, when I get around New Eden like a cheap Minmatar carebear whore enough for it to do so. Wormhole space I’d say is the worst offender. It’s very harrowing and isolating as the music should be to match the context, but fatally far too repetitive. I’m convinced it’s just one song, and this in particular makes me understand why most players turn sound off (I do when I’m there!). Maybe I just need to get out more as they say… To hear the other dozens of songs I’m not hearing. My only concern with this is that I’ve heard this exact complaint from a variety of capsuleers, many a time. Which to me implies it’s not having the effect it’s intended to. No complaints really, the ambience with this is nice. Good stuff. It’s not all bad! This is the core of the problem, and I think many other people’s dismay here. There isn’t enough of one when it comes to sound currently. As a collective for whatever reason the current sound system is not reaching the potential it could, and the “playing experience” is in turn suffering. Which might explain why people want the jukebox feature back or to turn sound off entirely. Fact: There are 74 songs in total from the original soundtrack & jukebox now on CCP’s Soundcloud page, yet all I hear in-game is the aptly named But Still We Go On. Admittedly it’s not an easy task. The hunt goes on for a satisfactory breakthrough plus balance in terms of overall sound for CCP and their crew. As it’s not seemingly super important and notably will take development time. Maybe all we can do is ride out the storm. After all so far I’ve not really provided any obvious solution or spark of genius on how to fix the problem, only what it possibly could be. The one solution I can think of to start with though is to either bring back the jukebox completely revamped. Containing new functionality and purpose, or alternatively go back to the drawing board with the current sound system. As it leaves much to be desired. Also I do not think there is enough usage of the update release songs we hear all too briefly. Perhaps we could add the new theme tracks to the jukebox if it does end up returning. As they seem far too short lived and frequent for anyone to get attached to them, or even have reason to listen to again at any point. I have to say though, short of these two things I’m at a loss for ideas. So does EVE have sound? Well it did once, sort of… And hopefully it will once again someday. Where the people who don’t acknowledge its existence have no choice but to, as it will be a much more integral part of the experience. What we need here perhaps is something old something new, so to speak. A system that emphasises EVE’s gloriously rich soundscape of old, and not the new underwhelmingly insufficient muscape one, to put it bluntly. In regards specifically to the jukebox. I don’t really care whether it returns or not, despite any sentimentality. What I care for is something better than the current rendition of sound in EVE making an entry. As it doesn’t seem all that impressive in mine and multiple other’s experience. If you agree with these sentiments then show your support on the thread from earlier, and let CCP know what you think. Ten points for every jukebox song name reference you spotted in this post by the way. Here are some of the remainder screenshots from 2014 I had taken but didn’t use for anything blog/media wise. Instead of deleting them or leaving them in my screenshot directory I’ve included them in this post for your viewing pleasure. Or displeasure depending upon your internet connection. These images are pretty big because of my desktops native resolution (sorry!). Most of these are from NPSI fleets such as Spectre Fleet, RvB Ganked, and Redemption Roams, or my random pirating lowsec roams. This post serves as my entry to the Pod and Planet Fiction Contest YC116 this year, and is based off of some dubious insurance fraud we keep running into at RvB Ganked, every week without fail. One of the two main characters featured is taken from a real EVE capsuleer who’s responsible for said fraud. Check out Vhuby Tenku’s killboard for my inspiration on writing this. Hope you enjoy, the content to be considered for judging starts from the next section onwards. Treyas began yawning heavily as the real-time monitor displayed his client’s name and case code ID. A depressingly familiar sight for the increasingly destitute space lawyer. He was early as usual, but lost in thought. “What am I gonna conjure up this time round… Same as last time I guess.” He thought to himself. His client Vhuby moped into the lobby wearing clothes fit for an Amarrian dissenter’s brothel. The disheartened lawyer waved discretely in her general direction, as she also began starring at the now pulsating monitor. A vibrantly highlighted label stated the word “OVERDUE” on the screen. Shortly after a representative quickly ushered the two into a court room, and a recitation in the rules of etiquette whilst “justice was in motion” began. Vhuby knew this self indulgent tripe off by heart. As this wasn’t the first time she’d been in such a predicament, this was in fact the same room, and station within Kemerk as before. “Who are you again?” Vhuby openly mused. Vhiskas went on at great length as to how Vhuby now had twenty-six charges of insurance fraud brought to her name, of which thirteen were classified as capital size Freighter incidents. With a ludicrous grand total of 28.26 billion ISK claimed over her self described “very unfortunate, badly timed accidents”. The Judge made clear their side were not convinced or even amused as to her explanations, and that there would also be no remorse as soon as tangible proof had presented itself. Vhuby really couldn’t give a trits worth of what they thought. As in truth, although she appeared dim-witted, un-interested, and asleep at times (which quite often she was). Her mind was that of an intergalactic fraud artist with such cunning, that you could host a “bonus room” with her and get away with it. Vhuby was however (regardless of her fraudulent intentions) a mildly ethical space citizen, and kept clear of anything that did not involve harassing the living implants out of her beloved CONCORD officials… if they had any. Vhiskas came to the end of his dramatic rhetoric, and facing Vhuby he continued by saying. Footage played out of Vhuby piloting a brand new rusty Fenrir, and openly conversing with a fleet of RvB Ganked pilots in her local chat channel. Begging for someone to activate the self imposed kill right so she could “Claim da insurance ISKies to get high n fly”. This time, things did not look optimistic. Treyas’s already slave like expression dropped even further for all in the room to see. Indicating subconsciously to everyone that he knew his work was now cut out for him, even more so than previously. Vhuby however did not care, nor was she paying attention. For she was glaring incessantly at her Neocom. Viewing what Treyas could only briefly make out as an outrageously expensive ‘Rocket’ dress on the NeX Store. He stood in silence for a moment whilst face palming dejectedly, only to mouth quietly “We’re so fucked”. Buy some time, he thought. The judge sat down comfortably, satisfied knowing now he at last had the proof he needed to put an end to this out right disregard and mockery of CONCORD’s well devised laws. “Look Vhuby, this time you’ve fucked it up completely.” he whispered forcefully. “Whilst you were shopping on your Neocom they’ve shown the black box recording from that last kill-right activation gank. This is the binding evidence they need to put you away for good! “Wait what?” She replied. “I must have forgotten to hack it last time” Vhuby dismay-fully let on. A desolate silence ensued, interrupted only by a stroke of unexpected brilliance from Treyas. Somehow from the back of his overburdened mind, he had remembered service order number 1337. This questionable legislation prohibited use of any local chat channel content as evidence, not within the sovereignty of CONCORD itself. Vhiskas spent far too long checking the archive for this “1337” legislation, but eventually to his utter bewilderment and despair found it to be valid. Treyas was in fact correct. Leaving Vhiskas with no choice but to issue a severe caution to Vhuby, personally promising her eventual downfall, but that she was free to go. The now wealthy space lawyer checked his flashing wallet balance, Vhuby had deposited a sum of 300 million ISK into the account. With the tagline “Thanks again scrublord! ♥” amended to the payment. Peacefully he gazed out onto an adjacent undocking area through the large station window. At ease and relieved by his recent constitutional brain wave. He would have savoured this moment longer, if his eye had not caught the already structure tanking Adrestia hurtling off the undock. Well out of docking range, with Vhuby as its suspect status pilot. Four Tengu’s were already in flight chasing the Adrestia, ready to read their forthcoming insurance enabling kill mail. Treyas looked on in despair, swallowed a blue pill booster, and laughed heartily whilst mumbling to himself “I’ll pencil her in for next week then”.